Combine almond meal, cream, caster sugar, biscuit, apple, lemon juice and cinnamon in a bowl. Cover. Place in the fridge for 4 hours to develop the flavours. Preheat oven to 190°C. Cut each pastry sheet into quarters diagonally. Spread one-eighth of the almond mixture over each pastry triangle. Starting at the long side, roll up to form a log. Shape into a crescent. Place on a non-stick baking tray. Bake for 20 minutes or until golden. Meanwhile, combine the icing sugar, water and extra lemon juice in a bowl. Brush the hot croissants with the icing. Dust with icing sugar, if desired. Serve warm or cold. Normandy 10 min. / 30 min. Step 1: Remove the black skin from the soles. Chop the parsley sprigs, discard the stems. Season fillets with salt and pepper. Step 2: Spread the flour in a plate. Dredge fillets in flour, shaking off any excess flour. Step 3: Melt 3 tablespoons of butter in a large skillet. Add a sole fillet or if the skillet is large enough, place 2 fillets at the same time. Cook over high heat for 5 minutes. Turn the fillet and cook on the other side for 5 minutes again. Step 4: Set aside and keep fillets warm. Sprinkle with lemon juice and parsley. Cook the other sole fillets the same way. Add butter if needed. Step 5: Melt the remaining butter in the skillet. When brown, remove from heat and place the sole fillets. Serving: Serve immediately. Garnish with lemon slices. Sole Meuniere is excellent in combination with potatoes or rice. Wine suggestion: Riesling, Chablis, Sancerre, dry white wine (French Wine Guide). 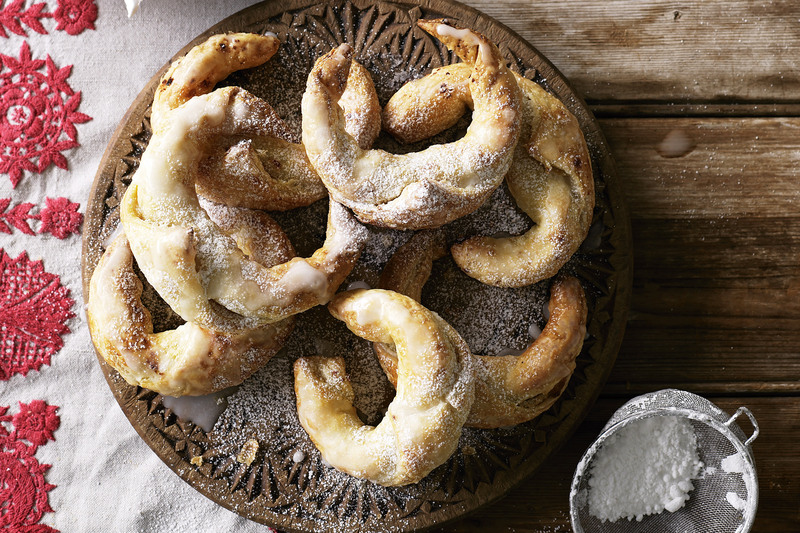 When one thinks of palmiers – the tiny scroll-like pastries – sweet, flaky cookies come to mind. While these are flaky and delicate like the original, that’s where the similarities end. This recipe for herbes de Provence palmiers uses a dried herbes de Provence and garlic for a fresh, sophisticated flavor. Roll the pastry dough into a large rectangle, about 15-inches by 12-inches. Using a mortar and pestle, crush the garlic glove into a smooth paste. Mix the garlic paste and olive oil together in a small bowl. Using a pastry brush or spoon, spread the garlic oil in a thin, even layer over the dough. Sprinkle the oiled surface with the herbes de Provence. Starting at the long ends of the rectangle, loosely roll each side inward until they meet in the middle. To hold difficult pastry together, brush it with the egg, if needed. Slice the pastry crosswise into 1/4-inch palmiers – they’ll look like little scrolls – and arrange them on a parchment-lined baking sheet. Sprinkle them with the ground black pepper and bake them for 12-15 minutes, until they puff and turn golden brown. Remove them from the baking sheet and serve warm or at room temperature. This herbes de Provence palmiers recipe makes 6 to 8 servings. Place shallot, bay leaf, peppercorns, vinegar, and wine in a saucepan. Bring to a boil, then reduce heat to medium and continue simmering until only 2 tablespoons of liquid remain. Pour in heavy cream and bring to a simmer; simmer until the cream has reduced by half. Increase heat to medium-high, and rapidly whisk in the butter, piece, by piece until it has melted into the cream and thickened it. Strain the sauce through a mesh strainer to remove the spices. Serve immediately. 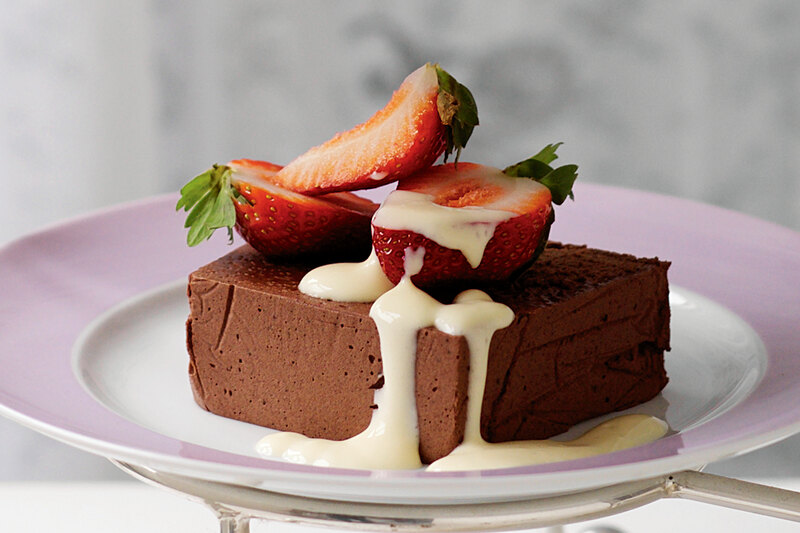 This traditional French chocolate dessert is loved by chocoholics the world over! Lightly grease an 8cm x 22cm (1-litre capacity) terrine. Line with plastic wrap, leaving the excess to hang over the sides. Use an electric mixer to beat yolks and sugar in a heatproof bowl for 5 minutes or until thick and pale. Place bowl over a pan of simmering water (make sure bowl doesn’t touch the water). Add chocolate and whisk for 5-6 minutes until melted. Add butter one piece at a time, whisking between each addition until melted. Remove from heat and fold in cocoa. Beat cream and vanilla until soft peaks form. Fold a little cream into chocolate mixture. Fold in remainder until combined. Pour into terrine, fold over plastic wrap to cover, then refrigerate overnight. Turn out terrine, cut into slices and top with strawberries and creme anglaise. 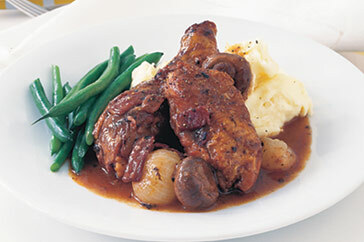 This aromatic French chicken stew contains a delicious blend of herbs and spices. Briefly rinse chicken cavity under cold running water. Pat dry inside and out with paper towel. Place, breast-side down, on a clean work surface. Use poultry shears to cut on either side of backbone and discard backbone. Cut breast in half, splitting breastbone. Use a sharp knife to cut each side in half, between thigh and breast. Cut drumstick from thigh, cut thigh in half. Remove wing from breast, then cut breast diagonally in half. Repeat with remaining chicken half, to make 12 pieces. Preheat oven to 180°C. Place flour in a bowl, season with salt and pepper. Toss chicken in flour and shake off excess. Heat oil in a frying pan over medium-high heat. Add a third of the chicken pieces and cook, turning chicken occasionally, for 8 minutes or until browned all over. Transfer to a ovenproof, flameproof dish. Repeat in 2 more batches with remaining chicken pieces. Add bacon to pan and cook, stirring, for 5 minutes or until bacon is browned. Place in pan with chicken. Add onions to saucepan and cook, stirring, for 8 minutes or until browned. Add mushrooms and garlic, cook, stirring, for 5 minutes or until mushrooms are tender. Add wine and bring to the boil. Stir in stock, brandy, tomato paste and bouquet garni and pour over chicken. Bake in preheated oven, covered, for 1 1/2 hours or until chicken is tender and sauce is slightly reduced. Serve with steamed green beans, if desired. Note: Make up to 1 day ahead. Store in airtight container in fridge. Reheat in saucepan over a medium-high heat, covered, for 15 minutes or until it comes to the boil. Garlic, saffron, orange rind and wine infuse this quick-and-healthy seafood soup. Heat the oil in a large saucepan over medium heat. Add the leek, garlic and saffron, and cook for 2 minutes or until the leek softens slightly. Add the wine and cook for 2 minutes or until the liquid reduces slightly. Add the stock, passata, thyme, orange rind, bay leaves and chilli powder, and season with pepper. Bring to a simmer over medium heat and cook for 5 minutes. Meanwhile, preheat grill on high. Place the bread on a baking tray and cook under grill for 1-2 minutes each side or until toasted. Add the fish and prawns to the stock mixture and cook for 2 minutes or until the fish and prawns are just cooked through. Ladle the soup among serving bowls and serve with the toast.